One of the basic tenets of any marketing strategy is consistency. You need to show up wherever you connect with potential customers with consistency, both in time and in content. But many (MANY!) clients find it hard to be consistent with their social media messages while also being consistent in making, listing, shipping, and writing content. The solution? Systems. The more systematic you make things (ie, you don't have to think about them each time you do them), the easier it is to be consistent. I'm still learning this lesson in a lot of ways, but when I shared by current system with the Starship, they really loved it. So I wanted to share it with you, if it'll help. Remember what I said last week – you need to keep your goals front and center. My goals for social media are to be helpful and spread love and silliness to my people. That's it. I want them to like clicking my links, so they trust me to provide good stuff. That's it. (In other words, I don't worry about time, reweets and I kinda hate favorites (they don't do anything to spread the post at all!)). Because my goal is to be helpful and loving, I don't measure my success by outward signs (followers, retweets), but by the conversations it sparks and the number of new people who join my world because of it. This balance changes all the time, but my #1 goal is to Be Me, no matter where I am or what I'm sharing. I installed CoSchedule recently and now, after a post is all finished and scheduled, we scroll down a bit and set up social messages. *And that's another system: Checklists! I have checklists for: blog posts, emails, launching a new class, Starship Boarding, Starship Welcoming…just about anything that happens more than once, so that every piece of content gets the same love and every student gets the same experience. (I try to keep an eye on what can be automated, like the Starship Orientation, and automate it after I experiment with what is working). This helps tremendously when I'm sick, or doing a big project like the CreativeLive class – it makes sure I do everything something needs, and I do the bare minimum (because the checklist just has to be marked off, not thought of anew, each time!). Lately I've been so busy with students and projects (1:1s, writing, recording, etc) that I haven't been taking the time to find good things to share on social media (Twitter + Facebook mostly). This is a huge reason why people follow me (at least, it's what they say! ), and I don't want to post just my own stuff (see above! )…and I've found when I just “look for stuff to post,” I just click around reading what I want to read, and don't share anything. So now, I have a system for it! On Mondays, I set a timer for 25 minutes. If I see something that I think would interest YOU (everything I ever write/post is with YOU, my readers and students, in mind), I read the whole thing and if I still like it, I use the Hootsuite* bookmark to grab it. I write a recommendation (or pull a quote), schedule it, and then post it. I keep my CoSchedule calendar open, so I'm sure not to overlap (I aim to have at least one thing in between my morning and afternoon self-tweets each day). I schedule at least one thing per weekday (or stop when I get to 25 min). If I find other things throughout the week (which always happens! ), I schedule it for the afternoon (after my last self-tweet). *Several students use and love Buffer. I have noticed that scheduled posts (both my own and shared links) get far less engagement (on both Twitter + FB) than when I just say random stuff, spur of the moment. That said, I need to spend most of my time NOT being spur of the moment (keeping my head in the game of producing good work), so I'm OK with that. If you're just beginning to share your work, do NOT let all these systems overwhelm you – they develop naturally over time as you become more and more effective at doing what you do. The goal isn't perfection (My system changes every few months! ), it's improvement. Just start with one system and continue to improve it as you learn more about what works for you. The goal with social media isn't perfection – it's improvement. This is the system that works for me, but it is in no way “optimized” to be the perfect, most traffic-generating thing ever. Keep your eye on your own goal, and find a system that works best for you! 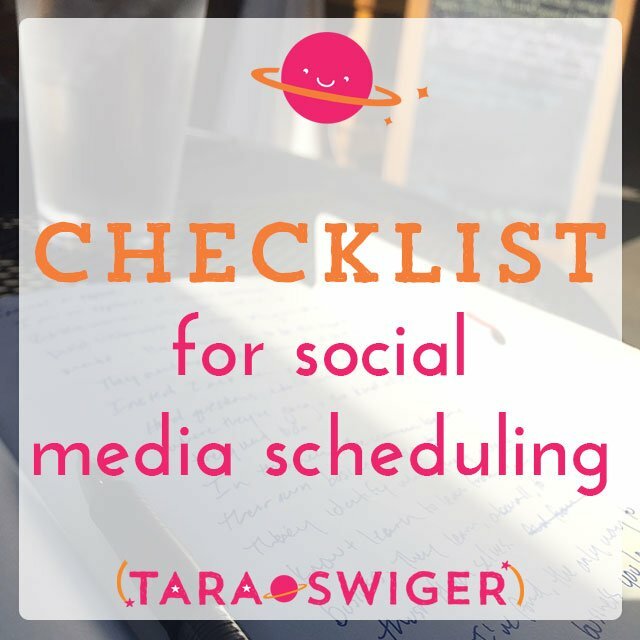 To help you do that, I've created a FREE checklist you can use to schedule your own social media! This easy format will remind you of all the steps, until pretty soon it'll be an automated process for you and it won't take much of your time at all to make sure you get the word out about your new posts + products. Enter your e-mail below and you'll get it right away! 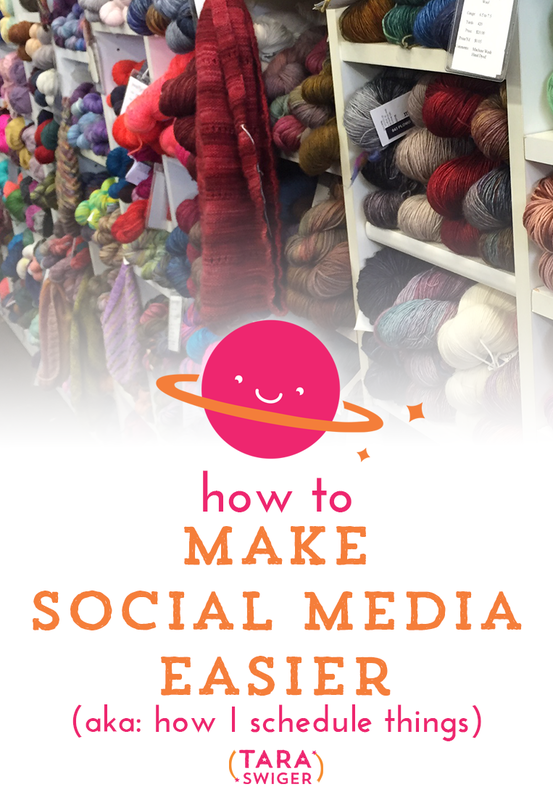 Enter your e-mail to get a FREE checklist for scheduling social media. Print it out or save it to your computer so you can always remember what to do and you don't have to waste time wondering what or when to post! Success! Now check your email to confirm and you'll get your free checklist! SO interesting ! Crossing my fingers that you will do a podcast on this, to hear a bit more about the thinking behind it all. It would be really helpful. My biggest take-away here is that scheduling tweets is ok. What I mean is that I’m not a fan of the idea of scheduling lots of tweets ahead of time. It feels like the reason for Social Media gets lost – the connection to people in real time disappears. BUT the way you schedule your references to past blog posts makes sense. I know that my older blogposts could have been missed by newer followers – and that those posts have valuable content in them, but I always forget to refer back to them. disappointed to discover CoShedule only works with WordPress – I’m on Tumblr. I love the principles though so am going to think about ways to integrate them into my workflow. Thanks! I love this, Tara! 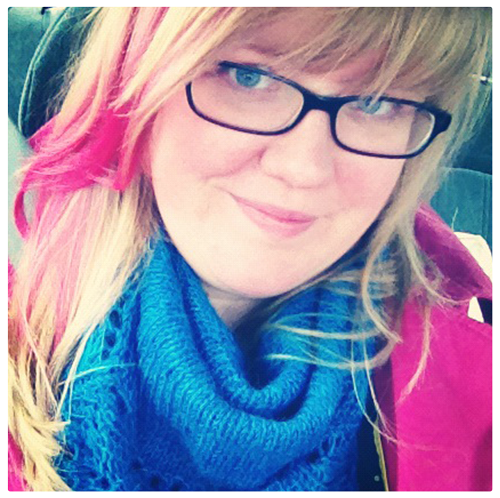 I am taking over everything at Handmade Success and need to get organized. I like how you share posts again on days that you do not have new content. I just like how thoughtful your whole approach is to social media. From your post I may need to look at sharing more unplanned posts via twitter. I’m a schedule geek and love to know everything is planned and ready. It does leave me room to have conversations and help people via twitter and LinkedIn but i don’t share alot of my personal life.